Ada pertanyaan untuk Pasiphae Hotel? Pasiphae Hotel, terletak di Heraklion Crete adalah pilihan yang populer bagi para wisatawan. Hotel ini terletak 1.0 km dari pusat kota dan menyediakan kemudahan akses ke fasilitas-fasilitas penting kota ini. Feri Heraklion, Museum Pertempuran Crete, Museum Arkeologi Heraklion juga bisa dijangkau dengan mudah. Fasilitas dan pelayanan yang ditawarkan oleh Pasiphae Hotel menjaminkan pengalaman menginap yang menyenangkan bagi para tamu. Ketika menginap di properti yang luar biasa ini, para tamu dapat menikmati layanan kamar 24 jam, WiFi gratis di semua kamar, resepsionis 24 jam, Wi-fi di tempat umum, tempat parkir mobil. Para tamu dapat memilih dari 19 kamar yang semuanya dilengkapi dengan suasana yang tenang dan harmonis. Disamping itu, hotel memiliki berbagai pilihan fasilitas rekreasi yang menjamin Anda melakukan bermacam hal selama menginap. Pasiphae Hotel adalah tempat menginap ideal bagi para wisatawan yang mencari pesona dan kenyamanan dari Crete. Decent size balcony, close to airport, 20 to 30 minute walk to town but some shops & restaurants in the closer neighborhood. Can walk to the bus station in about 10 to 15 minutes. Turn right as you come out of the hotel & head towards the water then follow the road to the left till you come to some large stairs that go down to the road with the ferry terminals & bus station. Turn left along this road to get to the bus station & continue on this & you'll arrive in town. It’s close to the main port just 13 mins walking. The man in the front desk is really nice. The room is simple and it misses some cups, spoons and pot; it has one little fridge. It’s close to the airport so most of the time you can hear the airplanes so close. Close to airport so was perfect for a transfer night. Really small rooms. Wifi and a/c. Staff was pleasant and helpful. Okay for a short stay. 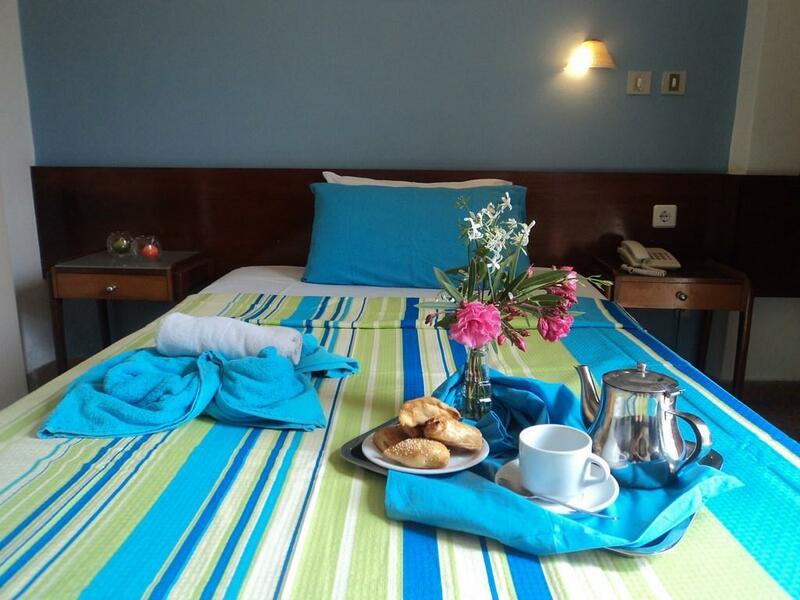 I was for vacation in Heraklion and a friend of mine recommended Pasiphae Hotel.the room was very clean,the staff (George, Elen Dimitris) was the best, very generous people and they always try to make you feel comfortable. 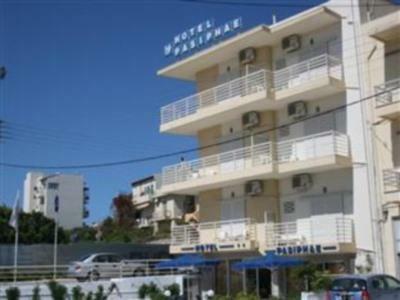 The hotel is very close to the airport and the bus station (city bus as well as the station for ChaniA)... Thank you guys , it was an excellent experience.. I totally recommend this hotel. Hope to come back again. location to Port. Comfortable bed. Walking distance to city. Only stayed one nigh as we had an early ferry to catch. The hotel is about 15 minute walk from Port. The room was clean and comfortable and the hotel was close to a city bus route. We only stayed at this hotel for one night (which is more than enough). The best thing about this place is that it's very close to the port in Heraklion. We had an early boat to catch which is why we chose the place. Other than that, there's not much to say about the place. Would only recommend if you need a place close to port. Quite good. The staff were very friendly and helpful, and though there is a bit of noise from planes, I was looking for a place to stay near the airport for one night, and it was perfect for that. Closed to Port & Bus Stop. Reasonable price and friendly staff teaching you how to find the way whatever you want to go. The location is closed to Port & Bus Stop in the center of City, reasonable price and friendly staff teaching you how to find the way whatever you want to go. But poor facility with small bathroom in the hotel if you can acceptance. There is a good choice and affordable to stay just one night for transportation to other city, but you may need to well prepare the equipment of traveling for yourself. If you're sailing into the harbor and don't want to walk far for decent accommodations, this is your place. Approximately 25 minutes walking from the center of town, staff is really friends, although they don't speak a lot of english. I wouldn't rely on them for recommendations in town. We got a great deal for booking early and off-season, under $20. I wouldn't pay much more then that, although they call themselves a hotel, they were very similar to our hostel in Athens, bare bones and not a whole lot more. They don't clean between nights either,if you are there for more than one. 방과 화장실이 정말 작습니다. 한국 가장 작은 모텔 보다도 더 작다고 생각하면 됩니다. 그리고 방에 냉장고가 없습니다. 또한 헤라클리온 대부분 관광시설, 버스노선은 구시가지(즉 성곽 내)에 있는데, 여기는 성곽 밖이고, 구시가지로 들어가기도 힘듭니다. 다만 항구여객 터미널과는 매우 가까운 장점은 있습니다. (뭐 구시가지에서도 여객터미널이 멀지는 않지만요) 화장실은 욕조가 미니 욕조가 있는데, 너무 작아서 욕조 안에서 손빨래 할 수가 없습니다. 욕조 바닥에서 하기에도 상당히 비좁고요. 그리고 욕조 바닥이 거칠 거칠한게 뭔가 더러운 것 같아서 기분이 나쁘기도 합니다. 침대 시트는 깨끗한 것 같은데, 담요같은 이불은 뭔가 더러운 것 같아서(시트가 없는 담요형 이불이에요) 아예 안 덮고 잤습니다. 그리고 헤라클리온은 인구밀도가 높고, 식당, 쇼핑 등 관광객을 위한 시설이 많은 구시가지와 이러한 시설들이 별로 없는 성곽 바깥이 있는데 이 호텔은 성곽 밖입니다. 관광을 위해서 오셨다면 가급적 호텔을 성곽 안 즉 구시가지 내로 잡기를 권장합니다. 그리고 헤라클리온 도시 자체가 별로 예쁘지 않아서, 크노소스 궁전과 고고학 박물관 보면 다 본거라는 이야기도 합니다. 장점은 일단 무선인터넷이 잘 터진다는 겁니다. 그리고 직원들이 비교적 편하고, 친절한 편입니다. Kleines Hotel in Iraklion, mitten in einem Wohnviertel, in der Nähe des Flughafens, gut für eine Nacht, wenn man im Dunkeln nicht mehr über die Berge fahren möchte. Über den Service kann ich nichts sagen, wir haben ihn nicht in Anspruch genommen. Es gibt auch so etwas wie ein Restaurant, aber da gibt es wohl nur Frühstück. Auf der kleinen Terrasse vor dem Haus kann man abends noch ein wenig draußen sitzen und bekommt auch ein Bier oder einen Wein. Parkplatz direkt vor der Tür.